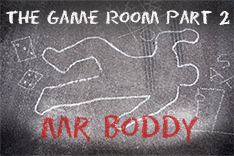 The Game Room Part 2: Mr Boddy is one of the many new games to hit the market trying to capitalize on the current craze for puzzle rooms. While none of these games can truly replicate the puzzles found in a puzzle room, there are differing approaches on how to bring the escape room experience home in a box. I have outlined a brief history of the puzzle room movement in the previous articles, so I will not re-hash that here. Where The Game Room differs from the other versions which we have previously reviewed is that this game can also be set up as a full party evening/activity. The instructions, which are available online with the purchase of the game, give full directions on how to setup your house to provide a great puzzle experience. It also gives you the option of creating your own props to use. Of course, in order to do this, you’ll need to have played through the puzzles yourself. This can be done as a solitaire activity, or you could use the preprinted puzzles to have a low-tech table based puzzle hunt of your own. Then, once you know how the puzzles work, you can then embellish them as you wish. Depending on how much work you put it on your own, you could even create a setting very similar to that found in the professional “escape rooms”. At this time, I haven’t yet hosted a party – so I’ll now do my best to comment on the puzzle solving experience – without any spoilers, of course! All the puzzles here are contained in five sealed envelopes. (In a real party, this might be five different rooms, each with the corresponding puzzle material found within). 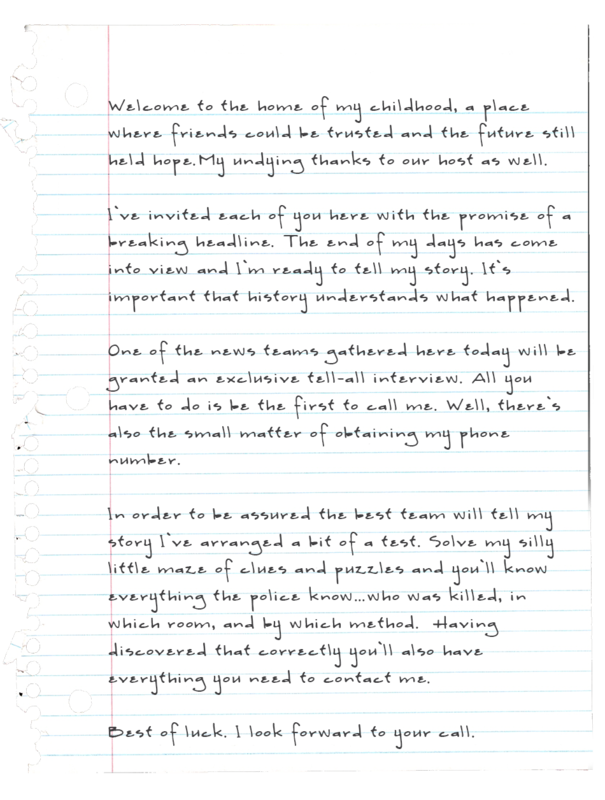 At the start, you get an introductory letter which outlines some of the rules and sets up the backstory as well as a smattering of clues in the form of pictures and other assorted things. Each of the puzzle envelopes has a “lock” on the front – perhaps the picture of a safe or a combination lock – etc. For the print and play version, each of these locks also has a QR code on it. You scan these codes with your smartphone to bring up a computerized version of that lock. You can then manipulate in to put in possible combinations. When you start the game, you aren’t given much direction as to which of the locks you are able to open, but you are reassured that you can solve at least one with the information at your hands. As you figure stuff out, you then load up the lock you think you can solve and try out the combination. If you’re correct, the phone will let you know and you can open up that envelope. 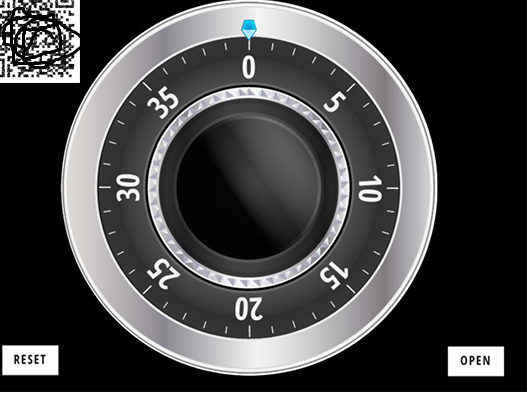 In the real life version, you might have an actual combination lock that you need to be able to open in order to proceed (i.e. enter a new room). The puzzles in the game are well crafted, and I would say that are moderate to above average in difficulty; certainly a bit harder than some of the other products we’ve played. Of course, this one is being funded via Kickstarter, so there is no expectation (at this time) of a mass market audience. Thus, I think the designers were able to ratchet up the difficulty a bit given their projected audience. There is a coded set of hints that is available to help you in case you get stuck, and once I figured out that I could solve the code, we put it aside. We ended up not needing it, but it should help you if you would need a little hint. We did read through them after we solved all the puzzles, and the hints are probably just enough to get you over the hump. Our group of four solvers made it through the puzzles in just over 40 minutes. We were fully engaged with the puzzles, and because of the more open-ended nature of the puzzles, we were generally all doing something the entire time. It was a very satisfying experience for us, and I am trying to set up an escape room party now and help lead another group through the experience. As it stands now, you get full online access to the game materials, so you can re-print any or all of the puzzles and props as needed. 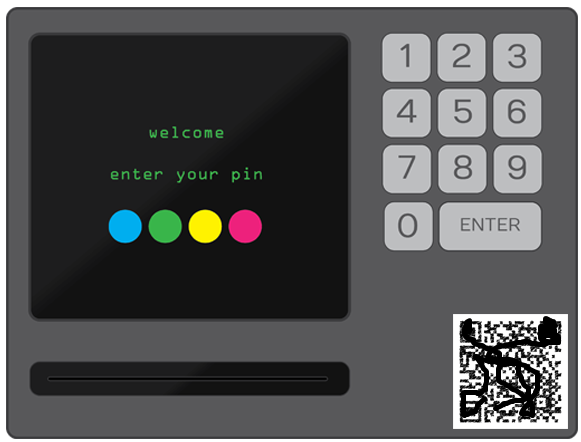 You are welcome to use the electronic QR-code triggered locks, or you can also purchase your own programmable locks if you’d prefer to have a physical side to your escape room. Thus, while you can only ever play through the puzzles once, you can host parties virtually an unlimited number of times. This one is supposed to hit Kickstarter soon, and I can say that our group has had a great time with it, and would recommend it to others wanted a puzzle hunt/escape room experience at home.